This research wanted to know the competitive strategy chosen by Desa Puri Syariah Hotel to face competition in sharia accommodation industry in order to achieve company goals and objectives. The design of this research is descriptive qualitative. The subjects or informants taken in this study were determined by purposive procedures. The data collection of this research is by deep interview. The conclusion of this research is with competitive strategy that applied, Desa Puri Syariah Hotel able to survive in the syariah accommodation business competition in Yogyakarta. Desa Puri Syariah Hotel can withstand the overall cost advantages that appear from the selling price of its rooms far below its competitors, the differentiation that trying to build compared to other sharia hotels is the familial relationships that management trying to build to its customers, and focus on providing halal service, Muslim niche market, and online marketing. MAKHASI, Ghifari Yuristiadhi Masyhari; CHASANAH, Uswatun. COMPETITIVE STRATEGY OF DESA PURI SYARIAH HOTEL IN THE CONTESTATION OF HALAL ACCOMMODATION SERVICE IN YOGYAKARTA. 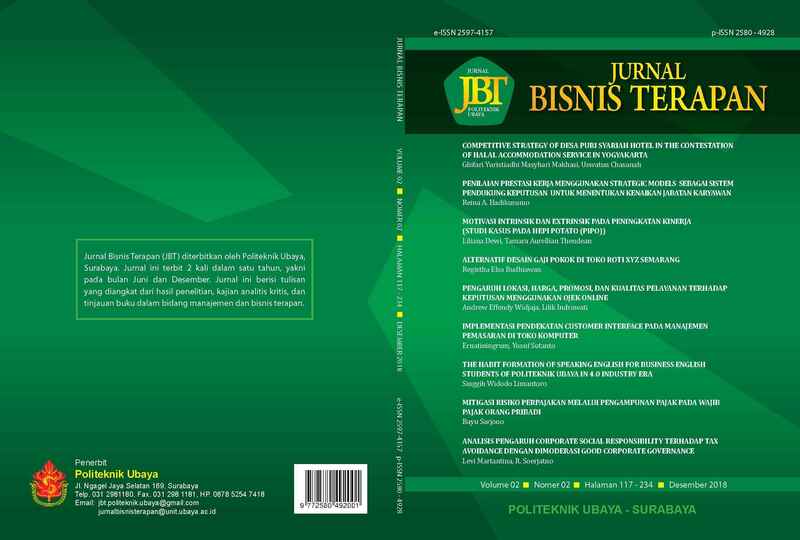 Jurnal Bisnis Terapan, [S.l. ], v. 2, n. 02, p. 117 - 132, dec. 2018. ISSN 2597-4157. Available at: <http://journal.ubaya.ac.id/index.php/JIBT/article/view/1605>. Date accessed: 21 apr. 2019. doi: https://doi.org/10.24123/jbt.v2i02.1605.